Description: Wolpertingers live in the alpine forests of Bavaria in Germany. It's body is a mish-mash of various parts. 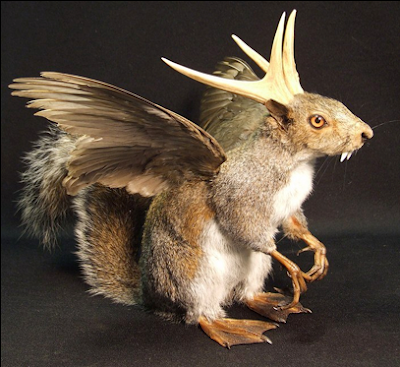 In general they have wings, antlers, tails, and fangs, all on a small animal like a rabbit or squirrel. Interesting Fact: They can actually be bought as souvenirs at inns and tourist shops in Germany. Yeesh! Click here for a picture. These creatures would be considered almost like a cousin to the American Jackalope or a Swedish Skvader. Do you know any of "W" creatures?